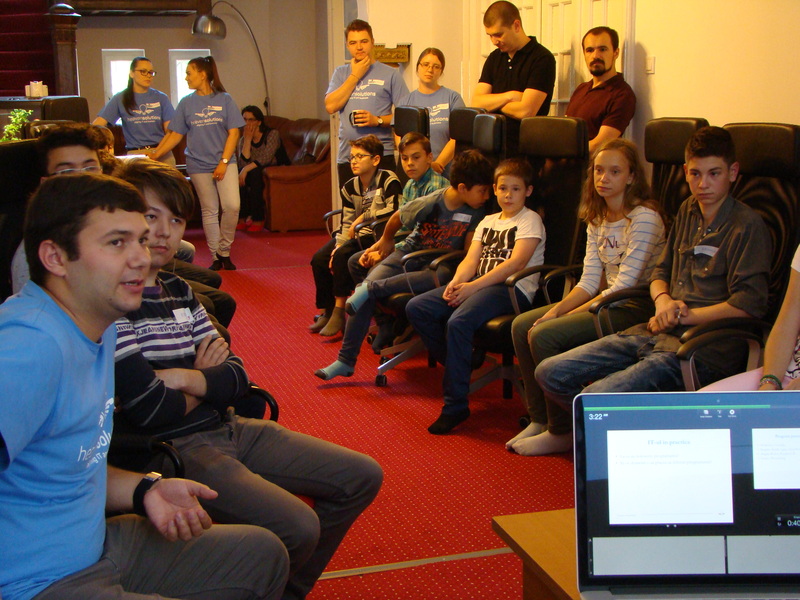 On the 26th of July, it finally hap­pened; CoderDojo Iasi visited the Heaven Solu­tions offices. CoderDojo is an inter­na­tional movement that started out in Ireland in 2011. Their vision is to provide kids who are inter­ested in IT with an informal learning envi­ronment. This includes regular ses­sions lead by vol­un­teers who also organise events and company visits. And who says the new gen­er­ation of IT pro­fes­sionals does not have high expec­ta­tions? Our team pre­pared this event with the same com­mitment and attention to detail as if it were a regular client. Finally, at 11am we could welcome 10 highly inter­ested young­sters who were filled with curiosity and passion learning more about the world of Infor­mation Tech­nology. Nev­er­theless, a neutral observer would have had a hard time deciding who was actually more excited, the HS team or the new gen­er­ation! Once everybody was handed out a name-tag and seated, Alexandra started with the intro­duction of the company. Of course, we kept this to the minimum then we all know that the guys did not come here to hear a 30min pre­sen­tation but rather to get their heads around actual com­puters and systems. Therefore, a 5min pre­sen­tation had to do it. The group split up into three, allowing the HS team members to introduce their area of work in much more detail. Topics covered were apps, smart-watch, 3D scanning, iRobot, and Rasp­berry pi. Espe­cially the iRobot got everyone really thrilled. Then again even we at the office love to play with it so no wonder they liked it. We hope that we at Heaven Solu­tions were able to open their eyes to the fast-moving world of tech­nology and could share with them our very own expe­rience, working in this industry. Time flies by and they will be the service providers of tomorrow and we might just have made a dif­ference.